When she returns to England after years spent abroad, Elizabeth must face the man who shattered her heart, and is shocked to find that the proud man she once knew is drastically altered. Does she have the courage to seek out the man whom she fell in love with—whatever the cost? Fitzwilliam Darcy has spent his days regretting what might have been and his nights being tormented by the decisions he has made. His life in tatters, he can barely face the once-respectable man in his mirror. Now that Elizabeth has returned, will he atone for his mistakes and win her heart for good? I was in college, taking an English lit course. I’ve never been very good at assigned reading so I got ’95 P&P, and, of course, fell in love. I did read the book for class and several times since. I warmed up to P&P immediately. Who doesn’t love a good Cinderella story, even if there are no magical shoes? Which is your favourite Austen book and which is your favourite character? It’s not very original, but P&P is my favourite book. (Although Jane’s History of England is probably my favourite piece.) My favourite character is probably Mr Bennet. He’s a terrible father and a terrible husband, but I don’t think he’s a bad man. He’s a product of his circumstances. I like that complexity. 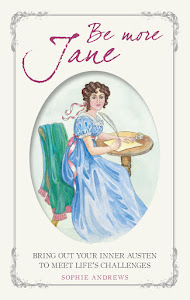 What first prompted you to write Jane Austen Fan Fiction (JAFF)? It’s been such a long time. That’s a difficult question. There was just something about the story pulled me in. I wanted to know more about the characters and so I wrote how I thought things might have continued. My first story was a modern, which I actually prefer to write, and it just flowed. I look back now and see the immaturity of it, but, at the time, it was a lot of fun. Are there any other authors that might inspire you to write fan fiction? If so, who? I wrote boy band fan fic well before Jane Austen. That was a truly embarrassing phase because I Mary Sue’d the hell out of myself. I could see myself writing some fan fic based on a couple of favourite comics—“Lucifer” & “Ruse”—and maybe Batman fic. I’ve been on a horror/sci-fi kick lately. I understand that you started out at Hyacinth Gardens, a JAFF site that no longer exists; many relative newcomers to JAFF, such as myself, weren’t aware of the genre at that time and might not know that HG was one of the earlier JAFF sites. How have things changed in JAFF since those days? What brought you back to this genre? 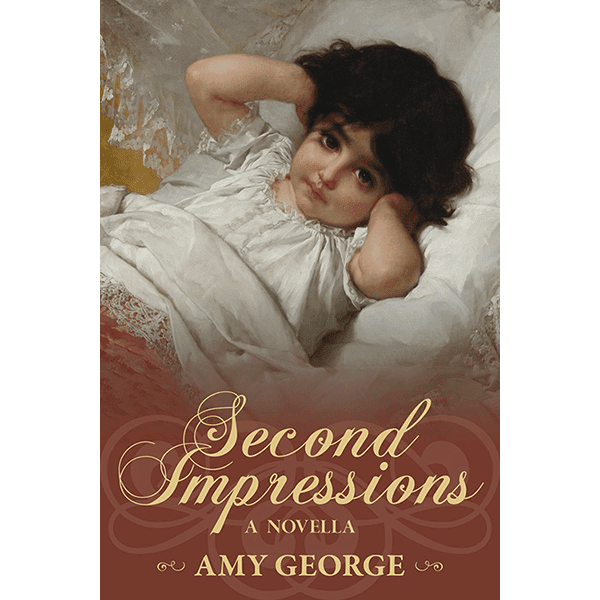 “Second Impressions” being published is the culmination of the effort of one of those remarkable friends, Debbie Styne, who was my editor on this book. She’s been trying to get me to publish something for ages. Do you read JAFF yourself? What type of JAFF do you prefer reading (modern/historical etc)? Do you like reading a similar style of book to the stories you write? When I was active in the community, I read a little bit of everything. Abigail’s [Reynolds] were so well written and magical. I loved “The Great Game,” a historical by Ayden and “The Luxury Gap,” a modern by Sharla. (I consider both classic JAFF.) I remember the first incarnation of “Fitzwilliam Darcy, Rock Star” because it was originally published on HG. In fact, I’m one of Richard’s groupies. As I mentioned earlier, I prefer writing modern—“Second Impressions” was actually a bit of an experiment for me—so reading historical is always a fun escape. Now onto your book – what inspired the story of ‘Second Impressions’? The most fun part of FF, in my opinion, is the “What If?” factor. What if Darcy or Lady Catherine didn’t bother to tell Elizabeth about his arrangement with Anne? What if he never shows up to propose a second time? How does the story end then? What path does ODC walk in that instance? Those questions are interesting. So I wrote this book to answer them for myself. And maybe for a Lovely Reader or two. From the blurb, it sounds as though you put Mr Darcy through the mill – does he deserve it?! I don’t know that he deserves it, but he certainly brought it upon himself in some ways. If he just wasn’t so damn haughty! Part of what I wanted to do with this book was to make Darcy a tragic figure mostly to see what he would do, and I think I managed to accomplish that a bit. Who in their right mind would deny JAFF readers a happy ending? What if those people found out where I live? I’m a writer. I’m not completely crazy. Who is the child in Darcy’s nursery (just kidding, that would be spoiler territory!)? Oh, I’ll answer that. She’s Grace. Last but not least: which Austen character do you think would suit you best for a happy ever after? Oh, dear. That’s a hard one, but let’s go with Knightley. Just to save him from Emma. Amy, thank you so much for your time, and for indulging my nosiness! It's been great to get to know a bit more about you. Meryton Press, the publisher of ‘Second Impressions’, is giving away 4 e-books / 4 paperbacks as part of the blog tour. To enter, log in to the rafflecopter via the link below. Please note that commenting on this blog post alone won’t enter you to the draw, you have to use the rafflecopter. The paperbacks are only available for residents of the contiguous United States to win but everybody can enter to win an e-book. But what if you can’t cope with the suspense of entering a giveaway, and need to read the book sooner? Don’t worry, you can buy a copy! The e-book is available to buy now: Amazon UK / Amazon US. 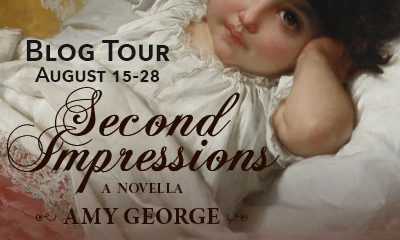 As this is a blog tour there are other stops where you can learn more about the book and read excerpts and guest posts from Amy George and reviews of ‘Second Impressions’. 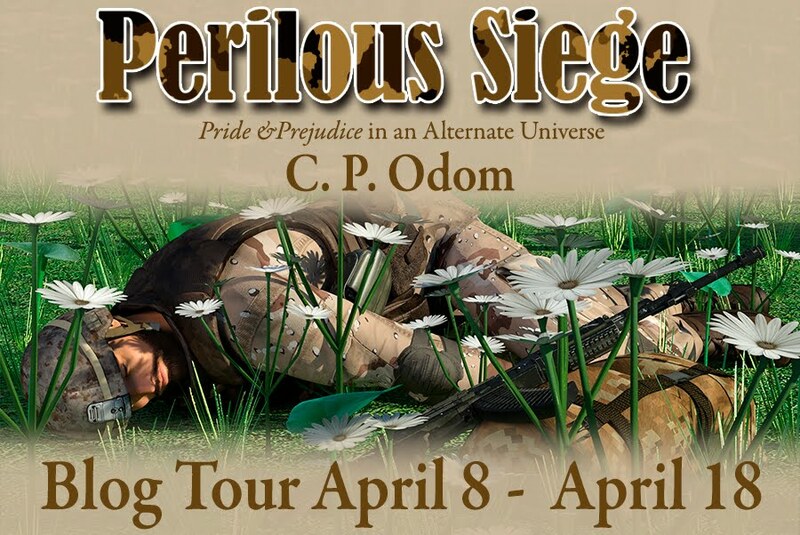 The blog tour stops are listed below. I'm really looking forward to reading 'Second Impressions'! When will the paperback become available? Love that fact that Amy's favourite character is Mr B! And of course I agree that he's a poor father and inadequate husband,his sardonic put downs only serve to drive Mrs B into another fit of vapours but he's an loveable character in many ways!! The what ifs that drive SI are interesting. What will happens of D doesn't return and propose a second time.....must confess I hadn't thought of the consequences of this. Would love to read this story and find out for myself how Darcy,having chosen another,finally gets a second chance at happiness!! Thank you, Mary! I must admit, I am fond of Mr Bennet too. He may not do everything he should, but I admire him for the fact that while he lives, he won't make his daughters pay for his errors. Other fathers might have tried to persuade their daughter to marry Collins, but Mr Bennet wouldn't choose to see his daughter married to a man who wouldn't make her happy. What a great interview! I also love that Mr. Bennet is your favorite character. I can't help myself, I love him too! After reading "Second Impressions," I look forward to more JAFF from Amy George. Thank you Claudine! I am quite fond of Mr Bennet too. I am glad you enjoyed 'Second Impressions'! Lovely interview! I Lewis two out of the three JAFF stories you mention and loved them too. Your answer to who's the child is made me chuckle... Looking forward to reading this novel. I haven't read the JAFF Amy mentioned, I'll have to look them up. Great interview... I would love to read this story! Thanks, Tere! I hope you get to read this story soon. Amy, you're so modest. Your own stories are some of the classics of JAFF! I look forward to reading this novella, as these blog posts have heightened the interest that the cover and blurb already had at a high point. Thanks, Ceri, for hosting an interesting interview! I had no idea about Hyacinth Gardens or that FD, Rockstar began on a FF site. Interesting! So glad Amy decided to publish this fascinating what if novella. Hi Sophia! I wasn't aware of JAFF in the Hyacinth Garden days either. As a relative newbie to the JAFF world, HG is something I sadly never came across but I'm so glad Fitzwilliam Darcy: Rock Star made it out into the wider world. It's one of the first "moderns" I read and remains a favourite. Amy's "what if" sounds fascinating and it's always great to see a new author getting published "officially" for the first time. Good luck with the launch and thanks so much for the giveaway. I agree with you 100%, Anji, I LOVED 'Fitzwilliam Darcy: Rock Star', so I am very glad that it came to be published. Amy's novel sounds like something I'd like to read too, and like you, I am so glad to see somebody making the jump from fanfic to published work. There are so many wonderful authors who not all of us get a chance to enjoy because they haven't published yet! I also read and enjoyed this book. Great review. So glad you enjoyed it, Sheila! I always like the what ifs stories. Sometimes these kind of stories make you think. That's what I love about what if stories too, BookLuver88, it really makes you consider what would have happened if certain things had been different. Ayden has a number of stories; all of which are excellent. I have read and reviewed 4 of those. Her use of the English language is so beautiful. They are reviewed on Goodreads The Improvement of Her Mind, The Windmills of their Minds and Ebb and Flow besides The Great Game. There are links to these unpublished stories. I highly recommend all of them. Thank you for the lovely interview! I am looking forward to reading this story! I have read many stories on DWG in the past so I will have to check out if yours were some of them! I loved your final answer...Knightley, if only to save him from Emma! Yes, I too would be interested in knowing when the paperback comes out...love the covers!